For many years my positive results for baking cakes came from a box. My first attempt at making a cake from scratch was a flop and, right then and there, I swore off baking. Gradually over time I have eased my way slowly attempting more complex desserts for special occasions and reintroducing baking into my life. I have had some great successes. The key to success is patience and a little knowledge all of which you will find in Maida Heatters's books. Baking is a precise science and cannot be approached like a bull in a china shop. 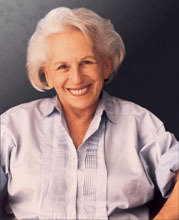 Maida Heatter is the "First Lady of Desserts" and number 16 on the list of Women Game Changers. One of my favourite well-travelled bloggers Mary of One Perfect Bite invited bloggers to travel along on a culinary journey throughout the year. Gourmet Live brought out a list of the 50 most influential women in food...Fifty women game changers. Some are chefs, some are food writers, and some are women who are passionate about the creative process. You could certainly add or detract women from this list, but no matter what these women have all influenced us in one way or another. Being a woman and passionate about food myself I wanted to explore and join Mary on this journey and not only learn from the masters but recreate some of their dishes to better understand what has shaped and molded them into who they are today. In doing so I have learned more about myself, and have learned more than a few new recipes and techniques. For 50 weeks we will experiment with dishes from each of the 50 influential women on "the list". Whether you agree or disagree with the authors chosen fifty and their order it will be an enjoyable and creative outlet to cook from the masters. Follow us on this journey while we take an in depth exploration of these women's lives and what has made them who they are. My cohorts for this adventure can be found below. If you would like to join in please contact Mary. This is an informal event and you have the flexibility to follow along when you can. We will be posting every Friday. I discovered a copy of Maida Heatter's Book of Great Desserts at the library several years ago and discovered the secret and you can too! Maida writes in her introduction to the chapter on cookies, "The rule is TLC—tender loving care. Do not just put cookies in the oven, set the timer, and walk away until the bell rings. You must watch them...and baby them." She somehow made me believe that if I actually followed her instructions, the ingredients called for would somehow transform themselves into something delicious. Her style is friendly and funny, thorough and exacting. Maida tells you what size egg to use and she does so to guarantee success. In her books Maida doesn't assume that you are a master of fancy cooking techniques nor does she demand leaps of faith from those following her recipes. Maida is a heroine, a godsend, an angel, to countless home cooks like me. Maida didn't set out to become a culinary legend. She never attended cooking school or apprenticed at a fancy French pâtisserie. Everything she knows about baking, she says, comes from her mother whom she describes as a wonderful cook, trial and error and her love of good cookbooks. If the name Heatter rings a bell, that’s because she is the daughter of radio commentator Gabriel Heatter who became famous during World War II broadcasts with his, “There is good news tonight.” catch phrase. Shortly after completing her degree in fashion illustration, she began a successful career working as an illustrator for the New York Herald Tribune. She left that when her hobby of making hand-worked silver rings turned into a full-time occupation, and she began toiling around the clock to fulfill orders for an expanded line of fashionable jewelry (and, later, hand-painted scarves and ties) for Macy's. She married pilot Ralph Daniels in the late 40’s and in the 60’s when her father became ill, she and her husband came up with the idea of opening a coffee shop in a chic Miami Beach neighborhood to stay close to home. Their coffee shop Inside was a huge success and soon grew into a full scale restaurant where Maida made all of the desserts. She began giving baking classes in her home but when the crowds grew too large, Burdine's, a local department store, began hosting the sessions. 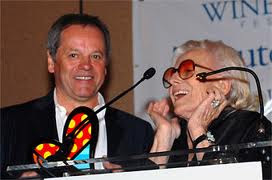 Craig Claiborne, then food editor of the New York Times, came by the restaurant to get the "scoop" when they offered elephant meat omelets for the Republican campaign. He didn't try the elephant meat (no one did) but what he went away raving about was the amazing array of desserts Maida was serving. She offered him copies of the handwritten recipes that she'd been giving out to the restaurant's customers for years. Claiborne was so impressed by them that he suggested she write a cookbook and the rest is history!! Over four years of blogging I have found many wonderful recipes to share on these pages. Some from my own kitchen, some from your creative blogs and web sites, and some from well known celebrities and chefs. I have been feeling a little nostalgic and was browsing these very pages just the other day, creeping back to the very beginning in 2006 when More Than Burnt Toast was in it's infancy and no more than "knee high to a grasshopper". We all have those stellar recipes from when we first started when we were lucky enough to find one comment and have maybe one reader; in my case even before I was taking photos of the dishes I prepared. My other motivation for reconnecting with the past is to create uniform formatting on this blog and this is a fun way for me to revisit past posts. 1. Preheat the oven to 375°. Line several large cookie sheets with parchment paper. In a microwave oven or in a medium heatproof bowl set over a saucepan of simmering water, melt the unsweetened and bittersweet chocolates. Let cool slightly. 2. In a medium bowl, whisk the flour with the baking soda and salt. In a large bowl, using an electric mixer, beat the butter at high speed until light and fluffy. Add the brown and granulated sugars and the vanilla and beat at medium speed until combined. Beat in the peanut butter, then the melted chocolate and the egg. At low speed, gradually beat the dry ingredients until incorporated into the cookie dough. 3. Using your hands, roll the dough into 48 one-inch balls and arrange 2 inches apart on the prepared baking sheets. Using the tines of a fork, flatten the balls to a 1/2-inch thickness. Bake 1 sheet of cookies at a time for about 12 minutes, or until the cookies are semifirm to the touch when lightly pressed. Rotate the cookie sheet halfway through baking for even browning. Slide the parchment paper with the cookies onto a wire rack to cool. Make Ahead: The cookies can be stored between sheets of wax paper overnight in an airtight container. You should submit this recipe to the cookie contest I blogged about. See my blog for details. Fantastic as always. Devilishly scrummy! That is just a fabulous combination. What a sweet treat week celebrating Maida Heatter! Who doesn't love the combination of chocolate and peanut butter! Mmmm Mmmm Mmmm! I'm a big fan of peanut butter cookies...but I'm totally cool with adding a bit of chocolate to my pb ;) If Maida dreamed it, it must be great! Wonderful post, Val! I used to have that Maida Heatter cookbook. My brother gave it to me thinking I should have a book by someone so renowned and classic. I was strangely intimidated by the recipes in it. I made her cream puffs and they flooped (although Julia Child's were a success). I made her lemon cake and it flopped. I ended up getting rid of the cookbook thinking I'd never use it. I came to regret it. Granted, baking has never been all that difficult for me. I loved the precision. I always liked the fact that you had to follow a formula. Cooking in some ways is more intimidating. "Bake at 350 degrees for 30 minutes" is far easier to do than "Cook over 'medium heat' for 10 minutes until reduced by half (was I supposed to measure at the beginning and the end to determine what is 'half')" I truly believe Maida Heatter and I parted company way too soon! These cookies are just proof of that. Yum! Perfect cookies for my husband ... a genuine pb and chocolate fanatic! I had never heard of Maida Heatter until this week ...go figure! I love the combination of chocolate and peanut butter! Looking forward to trying this out! Funny, I would have definitely pegged you for a natural when it comes to baking. My first attempt at baking a cake was in 7th grade home economics and for an open house. I mixed up baking soda and baking powder and my cake layers were about 1/4 inch thick!! Today, I'd call it a torte but back then I called it a disaster!! This is one cookbook author I've overlooked but I'm going to check her out. I'm also going to check out your back-to-the future recipe for grilled lamb. happiness is baking cookies - happiness is also eating them; those cookies look as though they would not last long in the house! You just can't beat a combo of peanut butter and chocolate. And these look so tender, Val. Moist and chewy. Double yum on any Maida Heatter recipe! Really enjoyed your post. 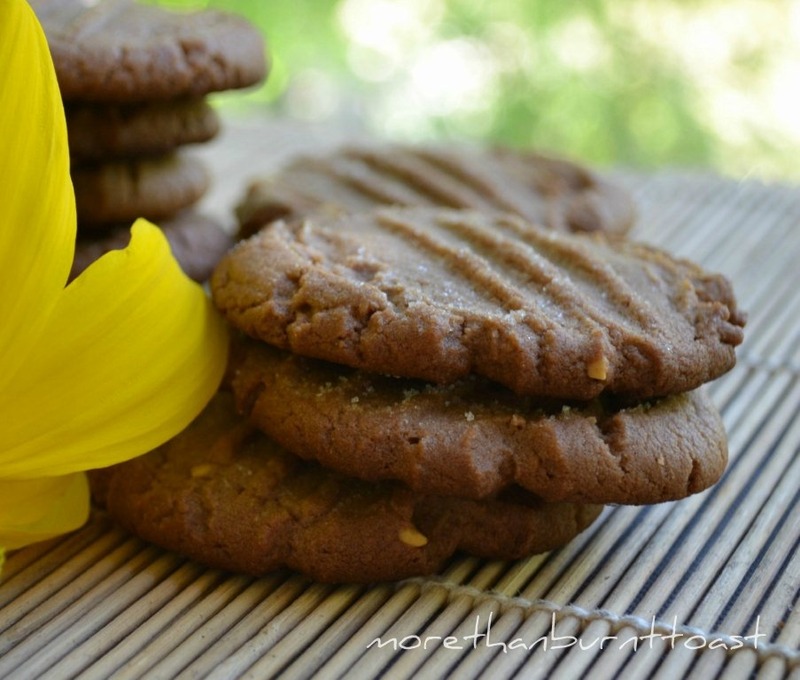 Great looking cookies...Chocolate peanut butter what could be better! I think we pretty much have cookies covered with Maida! And I haven't seen one I wouldn't like. So yummy! Chocolate and peanut butter are my all-time favorite combination. These cookies look delicious. I'm glad you're baking again! Is there any better pairing for a cookie...or for anything for that matter? A.Ma.Zing. I have never made a CHOCOLATE peanut butter cookie..Great idea,,and they look great too..thank you! Maida seems to be great. This recipe looks fantastic. Glad to see I wasn't the only one making cookies this week. Chocolate and peanut butter - delish! These sound like something everyone in my family would love. I've been cooking so many sweets lately you would think it was the holidays already. Well it looks like one more dessert to add to my list. I have not made peanut butter cookies for years and years and years... mainly due to so many allergic to the nuts - but no one here is. I love them. I had forgotten how much. I will have to dig out my mom's recipe and see how it compares to this one - or if it maybe IS this one. They look the same. Great read, Val, and you really took me back to the kitchen table of my childhood with this one. 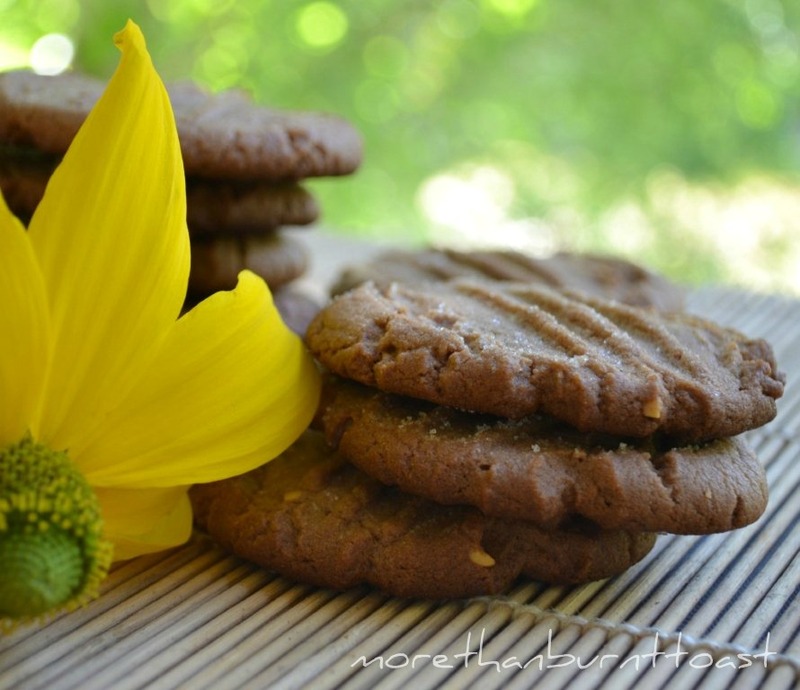 Peanut butter cookies of any time are such a favorite of mine. They always make me think of my dad because we used to eat them together. Great recipe! How a lovely and interesting post. And you right . with some experience, we , or I in my case learn how to bake a cake and no mix a premixing box cake. Is so nice to see how we and our blogs changes around the years. there are very few things that pair as well as chocolate and peanut butter. very few things indeed. i adore your blog. your writing is wonderful, fun and you have great recipes here. I have my oven preheating and was looking for a cookie to make. I have found it.